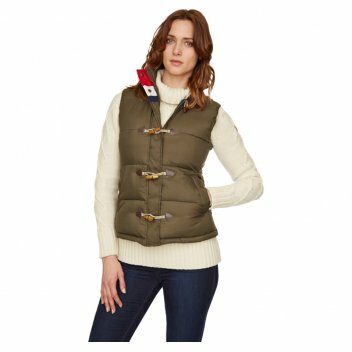 The Barbour Periscope is a quilted gilet for women. Crafted in a weatherproof outer with a stylish baffle-quilted effect, this warm gilet makes a great outer layer when the weather is milder. Two angled hand warmer pockets. Available in Olive/Union Jack. Part of the exclusive Ursula collection.